2018 Robert Brockman Robert Grundy Rose Meaghan Peter Stewart ⧫ Committee: Nathan Bevin, Alan Bottomley, Daniel Downham, Alieta Eyles, David Needham, Will Ponsonby, Garion Weller. WebMaster: Peter Stewart, Development Officer: Donna Meaghan. ⧫ Stan Wesley Trophy : awarded to Isaiah Sadiq and Tara Thiessen . ⧫ CP Maddern U-19 Carnival hosted in Hobart, 7-14 July 2018. ⧫ Centre damaged by flash floods on 10 May 2018, resulting in a substantial insurance claim. ⧫ Gosen Tas Teams Championship, 14 May. Alison Masterton, David Needham, Andrew Gardner. ⧫ Internal walls of centre painted cornflower blue and grey . (January) Photo. 2013 Robert Brockman John Henderson Rose Meaghan Alan Bottomley ⧫ 50th ANNIVERSARY of the H Thompson building (BBQ on 20 Oct 2013) . ⧫ CP Maddern U-19 Carnival hosted in Hobart, 6-13 July 2013. ⧫ TBA Reunion dinner,16 March. 312 attended. ⧫ WiFi network set up in the badminton centre. 2010 John Henderson Rodney Evans Tania Robinson Lenna Grainger ⧫ Robert Grundy awarded Life Membership ⧫ STBA website established. ⧫ Come & Try sessions started by Alan and Barbara Hall. 2009 John Henderson Bill Wyker Rose Meaghan Lenna Grainger ⧫ Clendinnen Shield hosted in Hobart. Rose Meaghan Lenna Grainger ⧫ Brian Cooper elected Life Member ⧫ Rally-point scoring introduced for all games. 2003 John Henderson Robert Grundy Rose Meaghan Lenna Grainger ⧫ June Bevan U-17 Carnival hosted in Hobart. ⧫ 76 ( ! ) people attend the 2003 Annual General Meeting. ⧫ Public address system installed in badminton centre. ($5,200). ⧫ Harry Thomson passes away. Harry Thompson, Barbara Wesley and Pauline Dobson for sevices to badminton. ⧫ Australian Business number (ABN 16 720 833 957) registered to STBA. 1997 Robert Grundy Terry Chapman Rose Meaghan June Pongratz ⧫"Badminton Tasmania" registered as a business name. 1994 Robert Grundy June Pongratz Rose Meaghan Gary Davy ⧫ STBA adopt the Model Rules (with amendments). ⧫ First World Masters Games in Australia (Brisbane. 26Sept-8Oct 1994). 1993 Terry Chapman June Pongratz Rose Meaghan Gary Davy ⧫ New courts (9,10,11,12) opened 4June 1993. ⧫ Clendinnen Shield hosted in Hobart. ⧫ Ross Livingston inducted into Sporting Hall of Fame. ⧫ Badminton becomes an Olympic sport (in Barcelona). (Retiring) Tony Geeves Barbara Wesley Gary Davy ⧫ First Hobart Veterans Carnival (72 entrants). 1989 Doug Wylie Ray Curran? Barbara Wesley Gary Davy ⧫ First Tasmanian Masters Games, Launceston 14 July 1989. 1988 Doug Wylie Ray Curran? J Fox, David Farnham, Tony Geeves. Jan Spencer Barbara Wesley ⧫ Australian U18 Carnival hosted 25May to 4 June 1982. 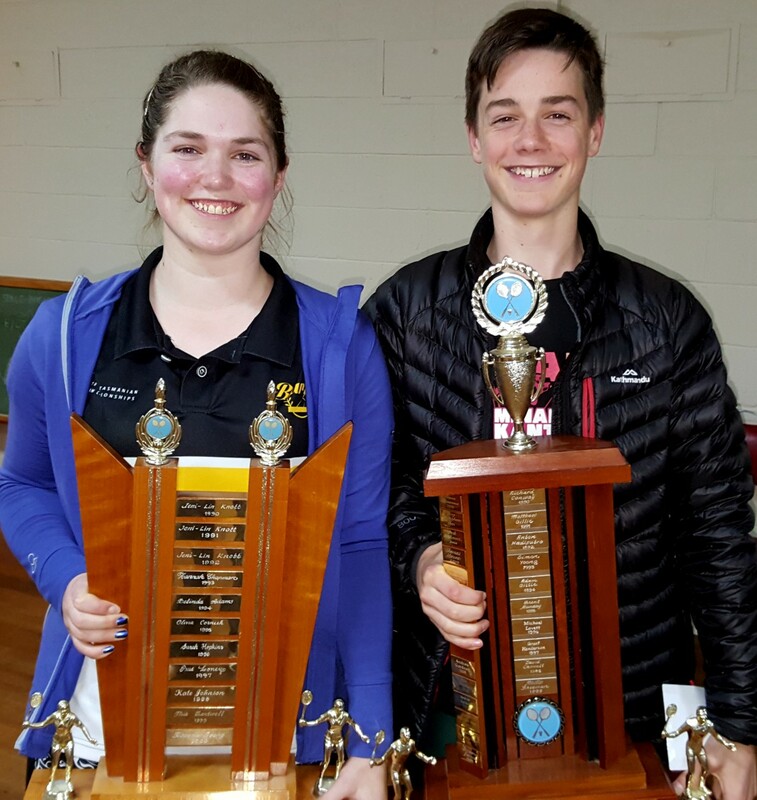 ⧫ Clendinnen Shield hosted in Hobart. Barbara Wesley D. Oates ⧫ Wooden floor replaced by new concrete floor with rubber ("Rubtan")overlay in the badminton centre. Barbara Wesley, Harry Thompson, George Jarvis, Doug Wylie. G.Turner/B.Wesley June Turner Smoking banned in the badminton hall henceforth ! ⧫ Committee: Stephen Doliver, George Jarvis(23rd year), Doug Wylie, Alex Young, Alan Gough, A Bond. J.Penwill/J.Court Barbara Wesley ⧫ Committee: George Jarvis, Alex Young, Frank Laird, J Koay, J Hill, H Thompson, D Oates. T Thompson Harry Thompson Frank Laird ⧫ Committee: A/Sec: D Oates, George Jarvis, J Hill, G Sansom, Alex Young, J Koay. Harry Thompson Frank Laird ⧫ Ross Livingston wins the Australian Singles title (in Hobart). ⧫ Multi-tiered seating installed in the centre. A Government grant of $500 was received to assist with the cost. Reg Moore Harry Thompson Frank Laird ⧫ Building damaged by '67 fires; some records lost. ⧫ 8 Umpire's chairs installed. ⧫ Committee: A/Sec: Don Oates, George Jarvis, Grant Taylor, D Castaldi, Ian Joseph, F Jacobs. Harry Thompson Frank Laird ⧫ Committee: A/Sec: C Facey, D Oates, G Jarvis, F Jacobs, B Elliott, D Castaldi, R Turnbull, W Conway. Committee: C Craske, Cecil Facey, Grant Taylor, W Conway, F Jacobs, B Elliott, George Jarvis. ⧫ Committee: A/Sec: C Facy, B Elliott, F Jacobs, G Hills, G Henderson, Frank Laird, George Jarvis. Harry Thompson Bernie Seidel ⧫ New 8-court Badminton Centre opened by the Premier of Tas, the Hon Eric Reece on 21 Oct 1963. ⧫ Committee: A/Sec: C Facy, G Hills, G Henderson, W Dixon, Frank Laird, George Jarvis. ⧫ Committee: C Facy, H Wilmot, Eric Richman, B Elliott, G Henderson, Frank Laird, W Dixon. D McKean Harry Thompson Bernie Seidel ⧫ A possible badminton hall on the site of the old South Hobart reservoir is proposed by Harry Thompson. ⧫ Committee: A/Sec: C Facy, R Collins, E Murray, C Hansch, Frank Laird, Phil Cooper. E Langdon Harry Thompson Mr P Turner ⧫ Committee: A/Sec: M Hornsey, R Turnbull, R Collins, P Forrest, Mr M O'May, Mr H Wilmot. E Langdon Cecil Facey Mrs K Johnson ⧫ Committee: A/Sec: Mr P Turner , R Turnbull, R Collins, P Forrest, Mr M O'May, Mr H Wilmot. E Langdon Cecil Facey Mrs K Johnson ⧫ Committee: A/Sec: Mr P Turner , R Turnbull, K Thomas, E Sproule, Miss T Richman, Mrs M Hornsey. 1940 World War II years. No interstate competition. ⧫ Tasmania wins the Clendinnen Shield (hosted in Hobart). with Reginald Ede Clendinnen elected as President and Harold Wray as Secretary. ⧫ March 4th, 1931 the Southern Tasmanian Badminton Association established. R. E. Chancellor R. E. Chancellor ⧫ Hobart Badminton Association formed. Queries or Suggestions ? Please contact the Webmaster Copyright � Southern Tas Badminton Assn Inc.